One of my favorite events of the year is the Craft Book Month Blog Hop hosted by Craft Buds. Now that I've gone through the process of writing a sewing book myself, I have a whole new level of respect for craft book authors. You're not just holding a book in your hands. Those pages represent.. It's easy for us to pick up a book, flip through the pages, and make a quick judgment of whether it's any good or not. I've been guilty of that myself. Now I look at the rows of colorful titles on the shelf at Barnes & Noble, and all I see is an ocean of blood, sweat, and tears. It makes me want to buy a copy of every new sewing book that comes out just to validate the work that I know went into it. As you can see by the stack above, which shows most of the books I've bought in the last year, I'm off to a good start. Meanwhile, I'm counting down the days until my book is released by Stash Books this coming March! So let's get to the good stuff! 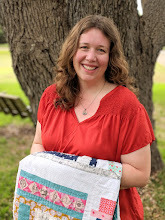 For my book, I chose Quilt Color Workshop by the brilliant Fat Quarterly Team: Tacha Bruecher, Brioni Greenberg, Lynne Goldsworthy, and John Adams. This book is like a college course on sewing with color. 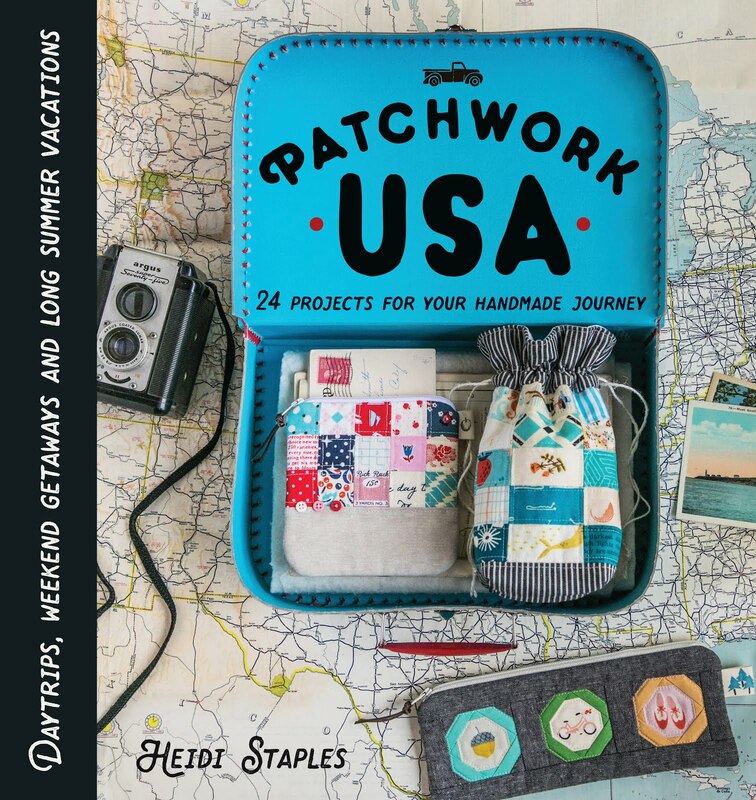 After giving you an overview of the basics, the book is divided into six sections -- by color, of course -- each filled with quilt block designs and a variety of projects. I absolutely love that each quilt block is presented in six different colorways, illustrating the six color relationships described in the introduction. It took me days to settle on just one project from this book, but I finally chose Tacha's Parquet Pillow. The original version above is done in a monotone colorway of green, white, and black. At first glance it looks like a simple cross design made more complicated, but all those thin strips of fabric sewn together give this pillow top an incredible sense of texture. I chose to make my pillow slightly smaller (nine blocks instead of sixteen) and went with a color scheme of purple, green, and cream. The colors are a bit out of my comfort zone, but I absolutely love the way it turned out. Most of my prints were from the new Cotton and Steel Basics, including the tiny green accents between the blocks, with favorite designs from Waterfront Park and Architextures mixed in too. The creamy background fabrics are Quilter's Linen and a great Paris map print by 3 Sisters. I used cream colored thread by Aurifil for all of the quilting. Since the blocks have more than enough movement in themselves with all that piecing, I restricted my quilting to the sashing and outer border of the pillow. The envelope backing features one of my all time favorite prints: Star Pods in green from Les Amis by Patty Sloniger. I decided to skip the binding around the edge of the pillow cover to keep things simple. I am absolutely thrilled with how this pillow turned out, and for the record, my husband insists that this is one of his favorite things I've made. He loves the limited color palette and simple design. Again, the texture of this piecing is fantastic. My girls love to run their fingers over the pillow top when they cuddle with it on the couch in the family room, and I admit, I do the same when no one's looking! Keep reading for all the details on the Craft Book Month Blog Hop -- prizes included! 9/1-9/30: Link up your craft book project at Craft Buds from your blog, your Flickr or (NEW THIS YEAR) Instagram, and enter to win prizes. Please hashtag your posts #craftbookmonth so we can find them! Note: Even if you share on instagram, please also come back and link the instagram URL in the linkup tool on Craft Buds to be eligible for prizes! You may link up any project you’ve made from a pattern in a craft book. That easy! You’ll tell us a little about the book, the project, how you personalized it, etc. Winners will be announced on Wednesday, October, 1! 3) Create a new blog post, instagram or Flickr photo (dated September 1, 2014 or later) and link back to Craft Buds/Craft Book Month in your post or photo description. In your post or photo description, make sure to list the craft book you used and provide a link if possible. I love your pillow, it turned out great! Thank you too for your perspective on what it takes to write one of these books! I'm guilty too of just glancing through them, I need to change that. I look forward to your book! I just love your version of this pillow - I would never think of purple and greens as a great match but they totally are! I really love these pillows! Great job. Craft Book month is a lot of fun- I enjoy seeing what others have made and participating too. Oh my word, that's beautiful! I've never been much of a purple fan, but my daughter has changed my mind recently... and now this is the icing on the cake. Can't wait for March to see all of your super projects! Stunning cushion Heidi - absolutely stunning. Fabulous pillow! The scale of that sashing is so sweet. I've been wondering how your book was coming along.....is it at publisher's yet? The churn dash is a wonderful way to frame a block. I sued that technique for a Green Tea and Sweet Tea block this summer when I made a mini quilt to swap. Loved the layers it added. Nice cushions. I haven't seen this book yet so thank you for sharing.